Next That Time Again . . . Thanks Linda. I JUST posted this one, after a walk to the business office. It’s cold outside! Loved this one, Cecelia … love that type of crunchy snow too — wish we had some! Believe me, if I could send some of our snow your way, I certainly would. Having said that however, I have enjoyed getting out in it every day thus far. It is rather invigorating. Take care and stay warm, and hopefully you will get a fair share of snow soon. This small stone project is wonderful… a great way to express daily gratitude. “Day 5” post is very auditory. I could almost hear snow crunching as I read the verse! Thanks Theresa. 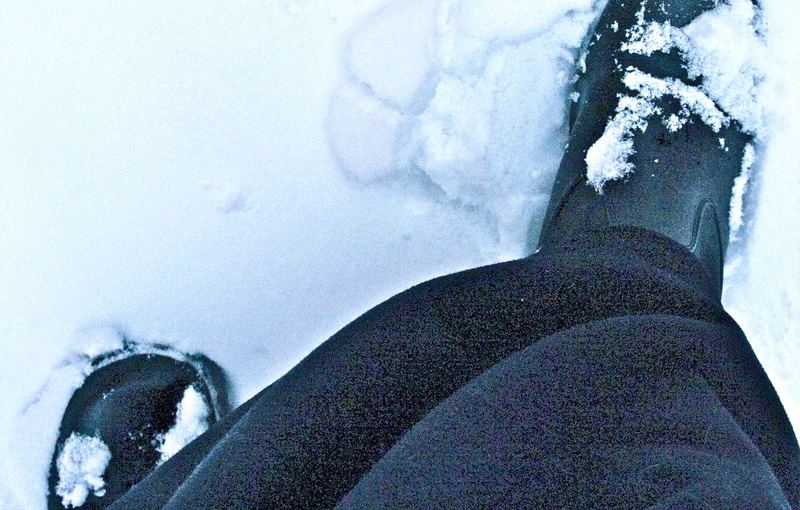 When I was out this morning, that’s what I noticed, the sound of my footsteps in the snow. Thanks for stopping by. I think a ‘cold shiver’ just went up my spine! But in a very good way! Yup! It’s cold outside. Brrrrrr…… Thanks for stopping by SIG. Stay warm! Are you sure that’s snow crunching or are you into the peanut brittle stash again ? Uh oh! Secret’s out of the bag!!! How’d ya know. 😉 Thanks for stopping by, Carl. Have a great day. Thanks for stopping by Margie. If I could send you some of this snow, I certainly would. From what I’ve heard, we are just getting started here! Much more to come in this winter season. Yes, it does get exhausting by the end of winter. This early snow still has the magical quality. Thanks for stopping by. I do appreciate it. Inspred indeed, Cecelia … and inspiring. Thank you, tms. Much appreciated. Oh, I love that crunch. Just wish we had some snow here to crunch on. In fact, I’m thinking about blogging about how much I want some snow. Stay warm, my friend. Thanks, Kathy. I’m doing my best to stay warm! I’m also sending wonderful thoughts of snow your way. It seems that those who don’t have snow, want it, but those of us who have it, would like a bit warmer weather. 😀 Take care, and you stay warm, too. Thanks Jo. Snow “deadens” sound so it is generally quiet out. But due to that quiet, every sound that is made is magnified. I don’t know of any other word that sounds like walking in snow other than “crunch.” I appreciate your stopping by. Ooh, the crunch of snow! I could just feel the cold weather by looking at the photo! Good job Cecelia! 🙂 Have a lovely day! Thanks Gracie Sam, I appreciate your comments. Glad, too, that you could “feel” the cold weather. That’s what I was aiming for. Why keep it all to myself! 😉 Thanks for stopping by. You have a lovely day, too! Hang on to your hat, Cecelia! Don’t let the winter wind steal it off your head. LOL! I’m hanging on to it!!! Although, I have lost a few in my life-time, but not today. Hope you are staying warm enough down in sunny Florida. 😉 Thanks for stopping by. inspiring cold, frenzied, crunch, wind — I feel it and hear it. love the photo, too. I’ve lost a few hats to the wind, too! Thanks for stopping by. It was quite cold this morning when I ventured outdoors, but through the day we began to thaw a bit, and by tomorrow we should have a good melt going on. I’m happy about all of that!